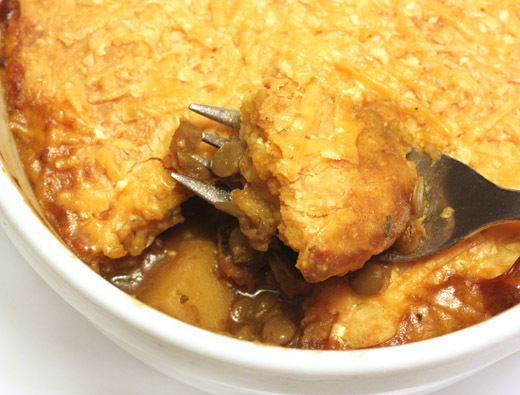 With a gouda cheese-filled, cornmeal biscuit topping and an earthy mushroom and lentil filling, I couldn’t pass up this pot pie. These were in the November issue of Bon Appetit, and there’s something irresistible about individual pot pies. You get to break into the crust, watch the steam escape, and then dig into your own little bowl of comfort food. I liked that these came with just a top crust which stayed nicely crisp while sealing off the bowls. And, the biscuit dough couldn’t have been easier to make. With the cornmeal in it, it was very easily handled, and it was simply divided into four pieces that were patted into rounds to cover the filling. The vegetarian filling here was hearty and full-flavored with the use of dried mushrooms, fresh mushrooms, potatoes, and lentils. The varied textures and rich and satisfying flavors made this recipe one for the permanent file. Although there a few steps to putting these together, those steps can be done a little at a time. For instance, you could cook the lentils two days in advance, then you could finish preparing the filling the next day, store it in the refrigerator already portioned into bowls, and top it with the biscuit dough the day after that. Once you have cooked lentils, you move on to re-hydrating dried porcini, and you should measure the water that’s used to re-hydrate them because it’s added to the filling mixture later. 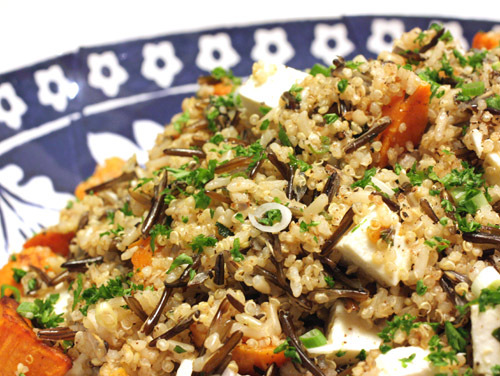 To start the filling, fresh, sliced mushrooms were sauteed in olive oil with carrots, sage, and thyme. Garlic was added followed by flour. After a roux was formed with the flour, the porcini soaking liquid was stirred into the mixture. The soaked and chopped porcini were added with potato chunks, some soy sauce, and a little tomato paste. All of that simmered until the potatoes were tender. The filling was divided among four oven-proof bowls. As I mentioned, the biscuit topping was very easy to make. Flour, cornmeal, baking powder, and salt were combined, and butter was worked into the mixture. Buttermilk brought the dough together, and then I added some shredded aged gouda into the dough. The dough was cut into four pieces, and each piece was simply patted into a circle to fit into each bowl. 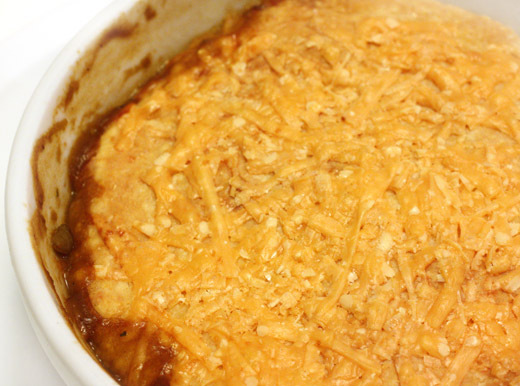 Last, the remaining shredded cheese was sprinkled on top of each pot pie. They baked for about 30 minutes. Mushrooms and lentils may not be pretty food, but the flavor with dried porcini and the boosts from soy sauce and tomato paste made up for the homely look. And, the flakey biscuit layer rich with aged gouda was a delicious cloak for the filling. In fact, that top biscuit layer got me thinking that pot pies should make occasional summer appearances because a filling of sweet corn and zucchini would be great under it too. Baking with mixed grains and different types of flours is appealing because of the endless flavor and texture possibilities. I’ve fiddled with whole wheat flour and wheat germ in chocolate chip cookies, and I’ve taken cues from a whole grain bread recipe and applied them to making bagels. Beyond that, I need help to know which types of flour work best together and in what proportion to one another they should be used. I finally picked up Good to the Grain which is teaching me those things. In the book, twelve different flours are covered with one chapter highlighting each, but typically the recipes involve a mix of multiple grains. There’s always an explanation for why each flour was included and what it brings to the recipe. For instance, with this coffee cake, graham flour, all-purpose flour, and whole grain pastry flour are used. Graham flour is whole wheat flour that has been coarsely ground, and it has a nutty, and for lack of a better word, wheaty taste. You could use whole wheat flour in its place, but if you can find graham flour, the flavor is a little more pronounced. The all-purpose flour was used to lighten the graham flour, and the whole grain pastry flour gave the cake tenderness. I have a bin where I keep my growing collection of flours, and I have a feeling with this book around, the whole collection will get regular use. This cake started with the apples which were cored and chopped, and as usual, I didn’t peel them. 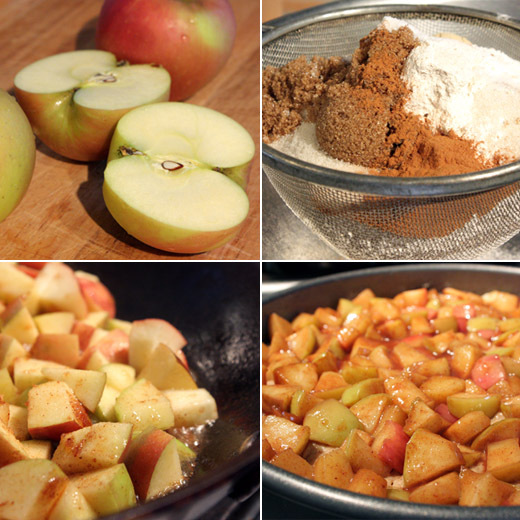 The apple chunks were added to a hot skillet with melted butter and cinnamon, and they were cooked until caramelized. I actually didn’t cook the apples down to complete tenderness because I prefer for the pieces to retain a little texture. Next, the dry ingredients for the batter were sifted together, and those included all-purpose flour, graham flour, whole-grain pastry flour, sugar, baking powder, baking soda, a tablespoon of cinnamon, ground ginger, and salt. In a separate bowl, some melted butter, buttermilk, plain yogurt, applesauce, and an egg were whisked together and then incorporated into the dry ingredients. 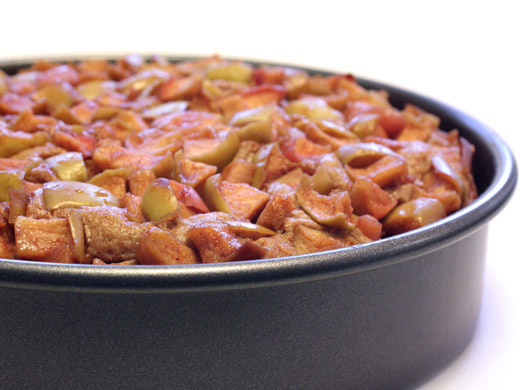 The batter was placed in a prepped nine inch cake pan, and the caramelized apples were spread on top before it baked for about 45 minutes. There were three important things going on with the flavor of this coffee cake, and the first was the graham flour tasting deliciously of toasted wheat. 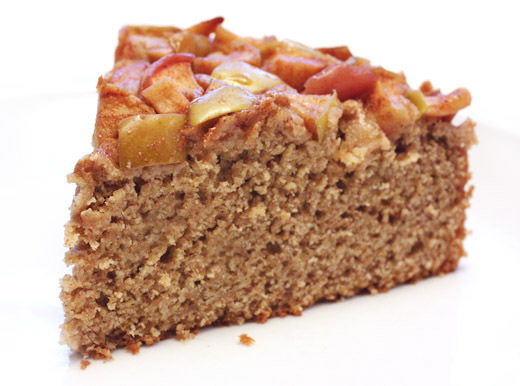 Also, the cinnamon spiced the cake nicely, and there were the fresh, tart, and sweet flavors of the caramelized apples. Now, about those three different flours working together, as promised, they produced a very tender, light crumb. I want to keep making this cake throughout the year and try it with different fruits as they come into season. I’m already imagining it with peaches. Joanne Chang, What Are You Reading? Growing up in a traditional Chinese household, Joanne Chang didn’t experience sweet desserts after meals until she was introduced to them by friends. Luckily for us, she did indeed develop a sweet tooth which led her to a serious interest in desserts and pastries. Sure, she dabbled in consulting after graduating with honors from Harvard with an Applied Mathematics and Economics degree, but soon enough, she began her career in food. After working at a few restaurants in Boston, she took the opportunity to work as a pastry cook at Payard Patisserie in New York before returning to Boston to open her own bakery. The name of that bakery, Flour, comes from the idea that even the most complex things start with basic elements. Today, there are three locations of Flour Bakery and Cafe, and Joanne is also an owner of Myers + Chang with her husband Christopher Myers. Last October, her book Flour was released, and I’ve been having a great time baking from it. The book will be celebrated this Sunday at the The Beard House in New York where Joanne will prepare a sweet and savory brunch including her famous sticky buns, smoked salmon tartines, bacon quiche, and brioche doughnuts with chocolate pudding. I managed to steal a moment of her time this week to ask, what are you reading? Thai Street Food by David Thompson- a truly gorgeous book. As inspiring as Hot, Sour, Salty, Sweet was to me when we first opened Myers+Chang. The recipes are all authentic and he doesn't take shortcuts. His exploration of the street foods of Thailand make you want to jump on the next plane to SE Asia. The photos are mouthwatering and the people watching from the book's vantage point is like being there. My Bread by Jim Lahey- I love his method of bread baking and have had such success with it at home. I love bread and My Bread allows me to enjoy it more easily at home. Tartine Bread by Chad Robertson- I'm as in love with this book as I am with Tartine , the pastry book. The methodical and professional explanation of how to make bread are terrific for someone like me who knows a bit about bread but wants to learn more. The Sweeter Side of Amy's Breads by Amy Scherber- Amy's Breads is my must-see place whenever I go to NYC. Of course the breads are great but over the years I've fallen in love with Amy's scones and cookies and cakes, all of which are in this book. She has a great matter of fact way of explaining the recipes and stories behind them that I always enjoy reading. Blood, Bones and Butter by Gabrielle Hamilton- My husband got an advance copy and I read it in one sitting. Prune is one of my favorite restaurants in NYC and I found Gabrielle's life story fascinating. She's lived about a million lives in one and she's the real deal. Thank you for participating, Joanne. Check back to see who answers the question next time and what other books are recommended. This really didn’t need to be so complicated. I asked Kurt what kind of cake he wanted for his birthday, and he didn’t say “you can decide” or “give me some options.” His answer was “German chocolate.” Easy enough, but then I proceeded to pull out every book I have with cakes in it and compare and contrast every recipe I could find for this type of cake. 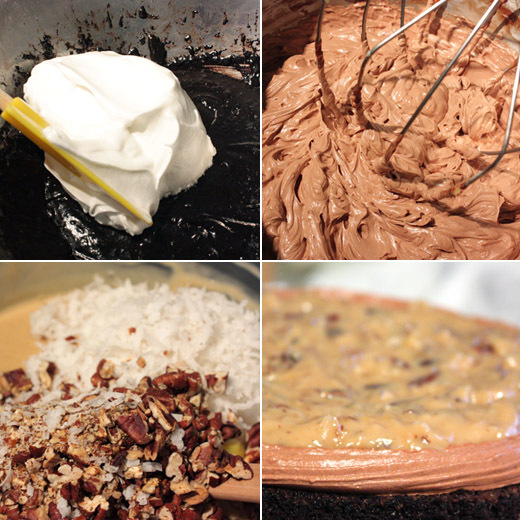 Then, I recalled that Bobby Flay had prepared a delectable-looking German chocolate cake on an episode of Throwdown. I found that recipe online too. So, let me explain my decision-making process for how I ended up with the cake you see here. Classic German chocolate cake frosting is what the cake is all about, but in Bobby Flay’s version, it became a coconut-pecan-cajeta frosting. I had to try that. However, the actual cake in his recipe was a little rich. His cake was also coated with a chocolate ganache and served with coconut whipped cream, and that seemed like too much to me. Then, there was the one in the Baked book. Again, the cake itself was a little rich with lots of butter, it had a more traditional coconut and pecan frosting, but it was also decorated with a ruffle of milk chocolate buttercream around the top. Last, I looked to The Greyston Bakery Cookbook where I found the layers were made from nice, airy chocolate chiffon, and the frosting was straightforward and traditional. Here’s what happened: I baked the chocolate chiffon layers from Greyston Bakery, I attempted Bobby Flay’s cajeta frosting and ended up changing it, and I coated the sides of the cake in the milk chocolate buttercream from Baked. Making the cake layers was simple, and they turned out lovely. The cake ingredients were whisked together, egg whites were whipped to soft peaks, and the whites were folded into the batter. No problems there. Then, I just knew by looking at Bobby’s cajeta frosting recipe there were going to be issues. I seem to lack the ability to make a mixture of caramel and milk thicken, but I foolishly moved forward anyway. You start by caramelizing sugar and then adding whole milk, coconut milk, goat milk, seeds from a vanilla bean, and some light corn syrup, and then you let that simmer and reduce for about an hour. I shouldn’t have turned away from the stove while milk was coming to a boil, and so that was exactly what I did at exactly the wrong moment. Of course, it did boil over, and I caught it a second too late. I moved the saucepan to another burner and continued. The mixture eventually reduced, but it didn’t seem to be thickening. After more than an hour of simmering, I turned off the heat and added the butter, vanilla extract, and rum and poured the milk mixture into a bowl to cool. It didn’t thicken, but it was delicious. Since I wasn’t willing to waste all those ingredients and because it was in fact quite delicious, I decided to wing it in an attempt to save the frosting. I poured the cooled mixture back into a clean saucepan and added two egg yolks and a another couple of tablespoons of butter. As it came back up to a simmer, it thickened and the frosting was saved. Back into a bowl it went to cool again, and then shredded coconut and chopped pecans were added. The version of the cake in the Baked book with the milk chocolate buttercream on top was calling to me. I made the buttercream. I pulled out a piping bag. I set one cake layer on a platter and piped a circle of buttercream around the perimeter to hold in the other frosting. The now cooled and thickened coconut pecan frosting was added inside the buttercream ring, and the second layer was set on top. Then, I realized that I have no business using a piping bag especially at the end of a long baking day. 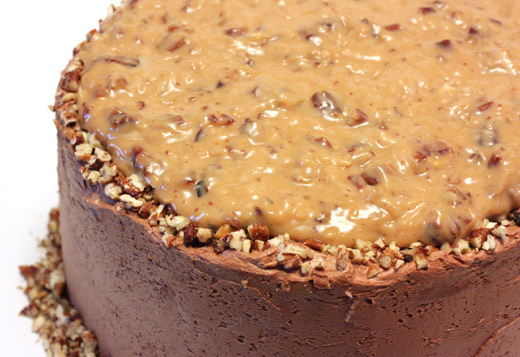 So I smoothed the chocolate frosting around the sides of the cake, added the remaining coconut pecan frosting on top, and decorated with a trail of finely chopped pecans around the base and top edge of the cake. I know, I completely over-complicated the process, but I learned something from it. The flavors in the Bobby Flay frosting were so fantastic I’m glad I attempted it. In fact, when Kurt tasted it, he even asked how it was made because it was so good, and he’s never before asked about how anything is actually made. Next time though, I’ll simplify the process by keeping the combination of whole milk, coconut milk, and goat milk, but I’ll make it the more traditional way from the beginning with egg yolks and more butter. 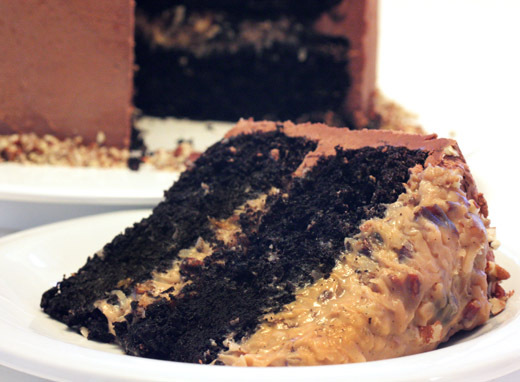 The chocolate chiffon layers were a very good choice, and I’ll definitely make those again. And, the milk chocolate buttercream was delicious on the cake and dressed it up a little even though it wasn’t piped into a pretty ruffle. Most importantly, Kurt really liked his birthday cake. For Kurt’s birthday week, because I like to celebrate things like birthdays for more than just one day, I always whip up some of his favorite foods. He’ll find scones in the kitchen for breakfast, usually his favorite pasta meal the day before or the day after his birthday, of course a birthday cake, and at some point in the week he’ll be served a meaty meal with some cut of beef. It’s not that he never gets to eat beef any other time of year. But, since I don’t eat it, I don’t choose to cook it unless it’s a special occasion and I’m also cooking something else for myself. This year, I cheated. I didn’t actually cook anything with beef. Instead, I devised a bistro-style menu which would include steak frites for Kurt and moules frites for me. I knew Kurt would prefer his steak to be grilled, and that meant he’d cook it himself. I was left to concentrate on the frites which could be kept warm in the oven while my mussels quickly steamed. It all sounded so easy. I made the fried matchstick potatoes from Barefoot in Paris , and the ale-steamed mussels from In the Kitchen with a Good Appetite . Naturally, my plan fell apart. The potatoes required more time for frying than I anticipated because there were more batches than expected, and of course, frying made a huge mess. 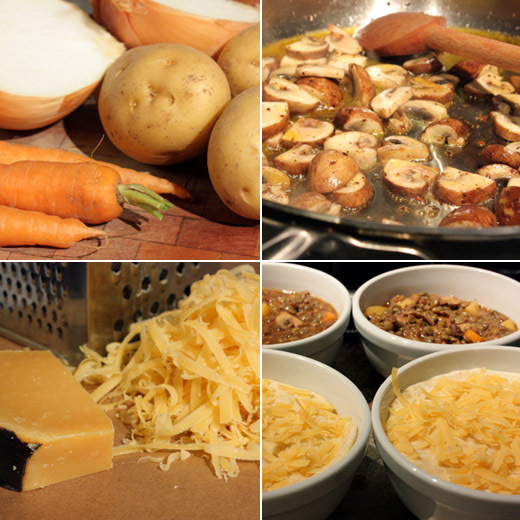 The potatoes were peeled and then cut on a benriner with the medium slicing blade attached. They were soaked in water, drained, and dried with towels. 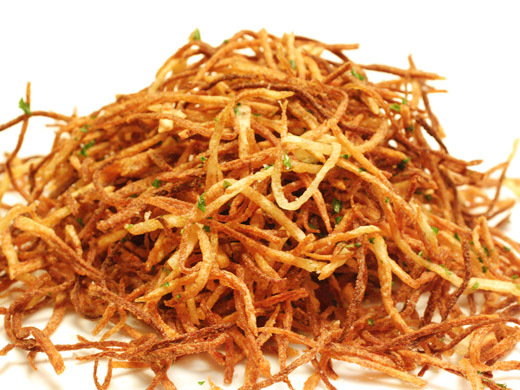 Matchstick-size fries are simpler to fry than thicker ones because there’s only one frying step. You don’t have to blanch in oil and then re-crisp since they’re so skinny. Just be sure to use a large pot with plenty of room, use a thermometer to check the oil temperature, and fry in small batches. Once the fries are removed from the oil, drain them on a rack set over a baking sheet, sprinkle with salt, and then keep them warm in a 250-300 degree F oven. Since I was hustling to finish frying all those batches of frites, I didn’t pay much attention to the mussels. Thankfully, they don’t require much attention. I soaked the mussels in water with some flour to be sure they were clean. Then, they were drained and rinsed. In another large pot on the stove, shallots and garlic were sauteed in olive oil. Some good Belgian ale was added and brought to a simmer, and then the mussels were placed in the pan, and the lid was set on top. When the mussels opened, they were transferred to a serving platter, Dijon mustard and butter were added to the ale mixture in the pot, and all of that was whisked to combine. 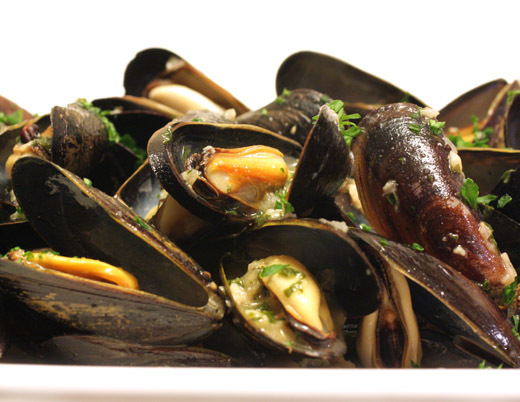 The resulting sauce was poured over the mussels before serving. It all worked out in the end; it just took a little longer than expected. 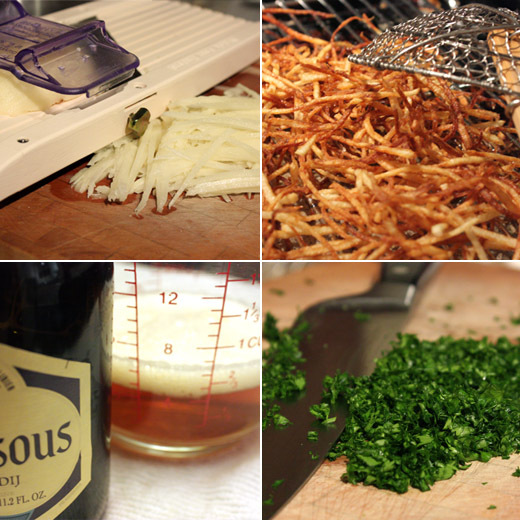 To serve the frites, they were piled on a platter, sprinkled with chopped parsley, and I added a drizzle of white truffle oil. After tasting them, the time it took to make them and the mess from frying didn’t matter anymore. They were pure, crispy goodness and with truffle oil were beyond words. I was thrilled with the mussels too, and I instantly thought this was the best version of mussels I’ve ever made at home. And, what about Kurt’s steak? He chose bison instead of beef, and grilled it to his own exacting standards. The bistro concept worked out great, but how could it not with a big, shared platter of frites? This looked a sure-fire idea when I saw it in the January issue of Living magazine. 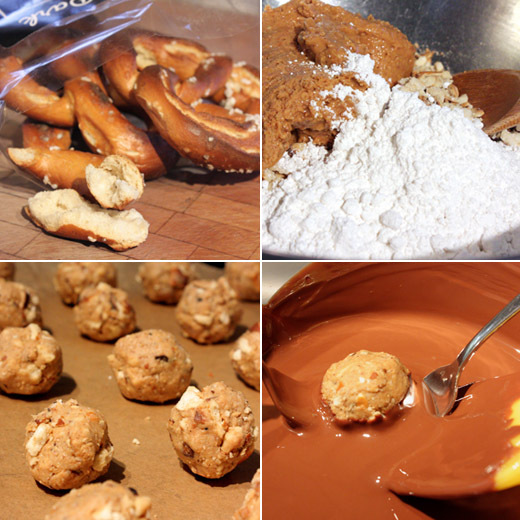 There’s no way a mix of salty pretzels, creamy, fresh peanut butter, and rich, melted chocolate could go wrong. The one-page article was about fresh hard pretzels sold at farmers’ markets. I’d never seen pretzels at our local markets, but I definitely would have bought them if I had. I checked with my friend Kristi, from Austin Farm to Table, who visited several farmers’ markets in different parts of the country last year, and she had only seen pretzels at a market in New York. I’m curious if anyone else gets to buy locally made pretzels at farmers’ markets, or if it’s just the lucky people of New York? Well, regardless of where you get the pretzels, and I found some very good ones at the grocery store, these candies are still going to be outstanding. 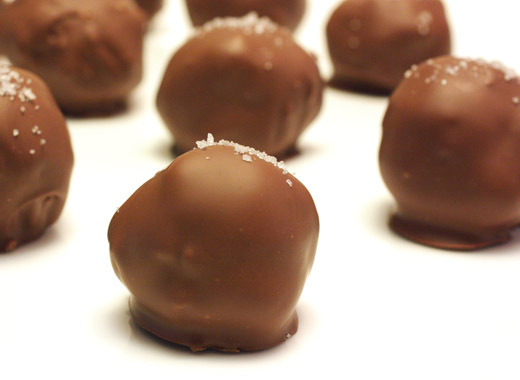 They’re simple to make and highly addictive. So, I bought some big, crunchy pretzels and proceeded to smash them which just seemed wrong even though it was necessary here. The crushed pretzel bits were combined with creamy, natural peanut butter, confectioners’ sugar, and a little room-temperature butter. All of that was stirred together, and then one inch balls were formed and set on a tray. The tray was placed in the freezer for 30 minutes to let the peanut butter become firm. Then, it was chocolate dipping time. I used milk chocolate, but you could use whatever you prefer. I like El Rey milk chocolate which has a slightly higher cacao percentage than others. After dipping each candy piece and before the chocolate completely set, I sprinkled sea salt on top. I’ve been craving peanut butter lately anyway, but still, these candies were especially delicious. 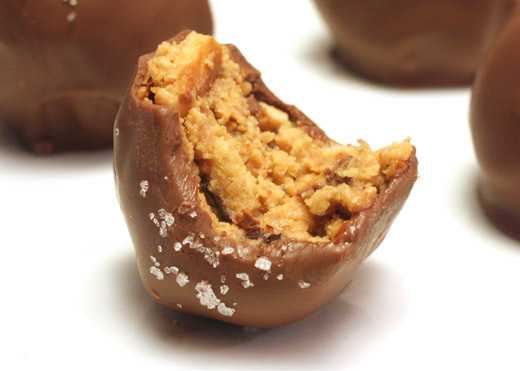 The little chunks of pretzel encased in mounds of peanut butter inside a chocolate coating were snacking bliss. I should probably conduct some experiments with almond, cashew, and pecan butter just to determine if any one of those is better than peanut butter. And, if I locate any locally made hard pretzels, I’ll try those too. Do you remember that list of 50 best cookbooks of all time from The Observer last August? (The top 10 are listed here.) That list was the reason I had to add Nigella’s How to Eat to my collection. I had failed to collect any of her books for the longest time, and I have no idea why that was because I always enjoy her show when I catch it on the Food Network. I did buy Nigella Christmas last year when it was marked down some ridiculous amount right after the holidays, but I didn’t have any of her earlier classics. How to Eat is what I would call a conversational cookbook. It’s written exactly as Nigella speaks, and she conveys her ideas about eating, entertaining, and planning and executing all sorts of meals. The text moves from one topic to another, and sometimes the recipes are really just written descriptions of how she puts a dish together. Mostly though, the recipes appear throughout the text in the conventional way with ingredients listed followed by instructions. It was interesting to read what types of dishes she chose for weekend Sunday lunch parties as opposed dinner parties. The lunches were chicken, pasta, cold meats, or stews, and the dinners were always three courses with seasonally appropriate roasted meats, vegetables, and dessert that usually involved fruit. There were many potato dishes, and many dishes with peas, and most of the desserts were creamy, pillowy creations. Most of the menus seemed a little heavy. Maybe it was because I had read through the book over the course of a few days rather than dipping in and out at different times, but when I arrived at the low fat chapter, it was refreshing to see some lighter fare. Or, I was just in the mood for that. 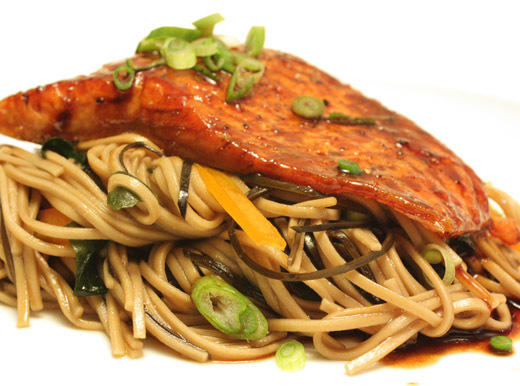 As soon as I read about the noodle salad with sea vegetables and simple teriyaki sauce for fish, I had a dinner plan. The noodle salad included both dried arame and wakame seaweed. If you’re not sure if you’ll like these, I recommend starting with arame and letting that be your gateway seaweed. It’s very mild in flavor and looks like skinny black pasta once rehydrated. Wakame is only slightly less mild, but it does taste a little more of the sea. Rehydrated, it looks like thawed, frozen, chopped spinach. Both were rehydrated in cool water and then drained. 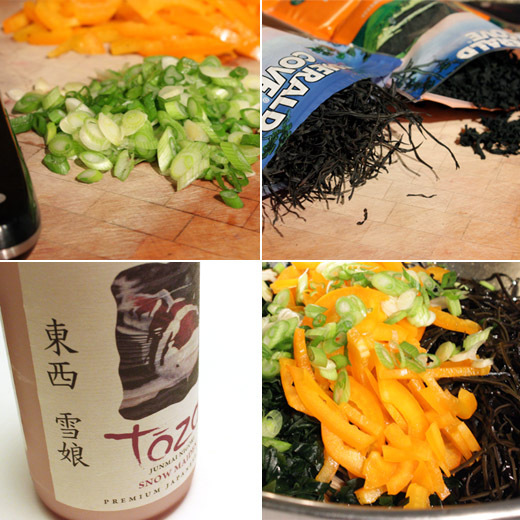 A dressing was made for the noodles with soy sauce, sake, mirin, rice vinegar, sugar, dashi, and sesame oil. I didn’t locate any dashi with no MSG, so I bought some bonito flakes and made a simple broth with a little boiling water. And, speaking of sake, I branched out in an attempt to learn more and tried an unfiltered option. The flavor was lightly floral compared to the last sake I used, and it seemed like a kinder, gentler sort of sake. Next, soba noodles were boiled, drained, rinsed, and drained again. The noodles were tossed with the dressing, the seaweeds, some sliced scallions, and I added some sliced orange bell pepper just because I had it on hand. The noodles can sit at room temperature, or they can be served cold. As they sat, I made the teriyaki sauce for the salmon from soy sauce, sake, mirin, and a pinch of sugar. The sauce was cooked in a pan just to dissolve the sugar while the fish was seared in a skillet. After searing the fish on both sides, the sauce was added and was used to baste the fish. The fish was removed so as not to overcook, and the sauce was left to thicken. 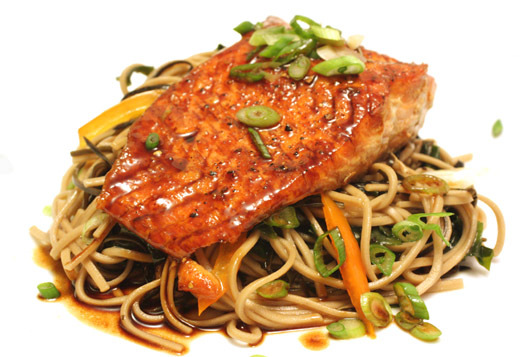 I served the noodles topped by the fish with the thickened teriyaki sauce poured over top. I knew this was going to be a good meal. For me, these flavors never disappoint. I made extra noodles, and the next day I enjoyed them cold from the refrigerator for lunch with chunks of tofu instead of salmon. Next time, I’ll probably add broccoli or greens. 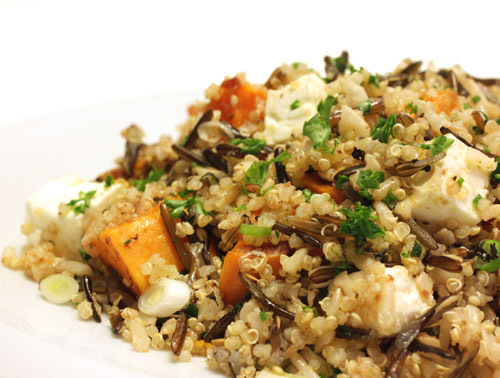 It’s great to learn this kind of adaptable dish that you can make a little differently each time you serve it. Something about these cookies intrigued me. The photo I saw of them was fetching, the technique for making them was interesting, and I don’t think I’d ever seen cookies like these before. I came across them in Baking with Julia , and the recipe was contributed by Nick Malgieri. 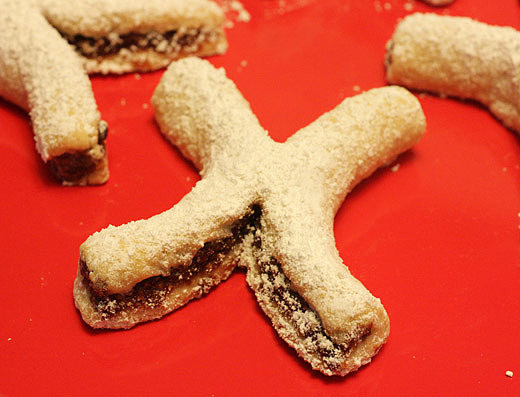 They’re like a Sicilian homemade Fig Newton except for the shape of course. 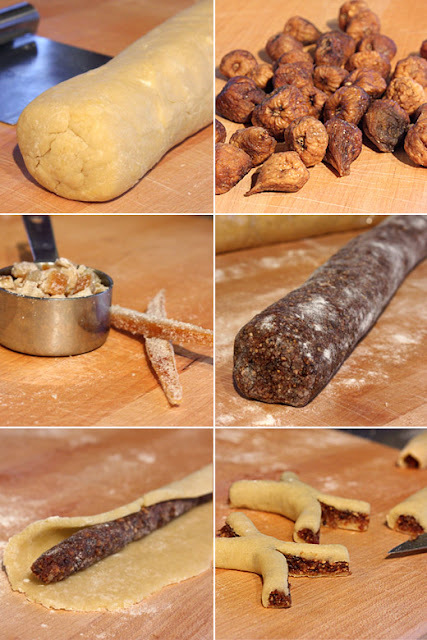 A fig filling, and let me tell you that was one amazing fig filling, was wrapped in dough, rolled into a long cylinder, and cut into pieces which were sliced on the ends and pulled into an X. This was a little bit of a project compared to simpler drop cookies, but I thought the process was fun since it worked exactly as described with no problems. Regarding that filling, it was a grown-up kind of fig filling full of aromatic and delicious things mixed with dried figs like almonds, apricot preserves, golden raisins, candied orange peel, chocolate, dark rum, and cinnamon. I tasted the filling just after it was pureed and realized it could have been served in bowls for dessert all by itself. There’s only a small amount of chocolate, so it doesn’t taste like a chocolate Fig Newton, but the chocolate with all the other filling ingredients makes it a sophisticated mix of flavors. And, the shape is an X which is appropriate for Valentine’s Day even though I didn’t make any O’s, right? The pastry and the filling were both made in a food processor, and cleaning between steps wasn’t even necessary. The pastry, or pasta frolla, was made by pulsing flour, sugar, baking powder, and salt in the food processor before adding chopped, cold butter. The butter was cut into the flour by pulsing, and then eggs were added and mixed to form a dough. The dough was kneaded briefly, formed into a log, and covered and set aside. The bowl of the food processor was set back in place, and the filling was made in it next. That was a pureed mix of chopped dried figs, toasted and chopped almonds, apricot preserves, golden raisins, candied orange peel, and yes I was thrilled to use my own candied orange peel again, chopped semisweet chocolate, dark rum, and cinnamon. There are great tips in the recipe such as reminding you that the dried fruit will not become softer or moister after baking. Therefore, if your dried fruits are too dry, they should be plumped in water and drained before using. Although I was tempted to stop there and just eat the filling with a spoon or maybe save a little to plop on top of yogurt for breakfast the next morning, I did continue with the recipe by forming the filling into a log and cutting that into 12 pieces. The pastry was also cut into 12 pieces. Working with one piece of pastry at a time, it was rolled against the countertop into a rope 15 inches long. Then, it was flattened into a three inch wide rectangle. Don’t even bother with a rolling pin. The dough is very easy to press and flatten into the rectangular shape. Just have some flour nearby to sprinkle on the counter to prevent sticking. Next, one piece of filling was rolled into a 15 inch long rope and set on the pastry. The pastry was rolled around the filling and pressed to seal. That filled rope shape was cut into three inch long pieces. Each piece was cut on each end so the ends could be pulled out to form an X shape. It’s really more complicated to write this than it was to do it. 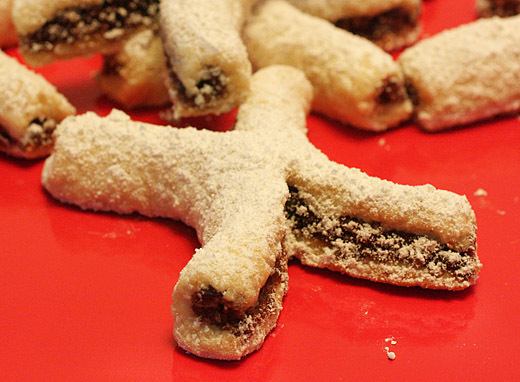 The cookies were baked, cooled, and then topped with confectioners’ sugar. Even though these cookies involved a pastry dough and rolling and shaping, they were far easier than I expected. The dough behaved perfectly, and making the X shapes was quick and painless. The recipe makes a lot of cookies, five dozen in fact, and they keep well for about a week at room temperature. I stashed several of them in the freezer since even we couldn’t get through that many in one week. Whether it was the shape, the fun of making them, or that incredible filling, these have found a place on my favorites list. Cheryl Tan, What Are You Reading? Cheryl Tan is a New York-based writer with experience as a staff writer at the Wall Street Journal, In Style magazine and the Baltimore Sun. Her stories have also appeared in The New York Times, The Washington Post, Marie Claire, Every Day With Rachael Ray, Family Circle, Bloomberg Businessweek, Chicago Tribune, The (Portland) Oregonian, The (Topeka) Capital-Journal, The (Singapore) Straits Times and Elle.com. She is also a regular contributor to The Atlantic Food Channel. I've been following Cheryl on Twitter where she mentions her travels, her work, and where she organized the Let's Lunch group that always cooks up great things with a given theme. 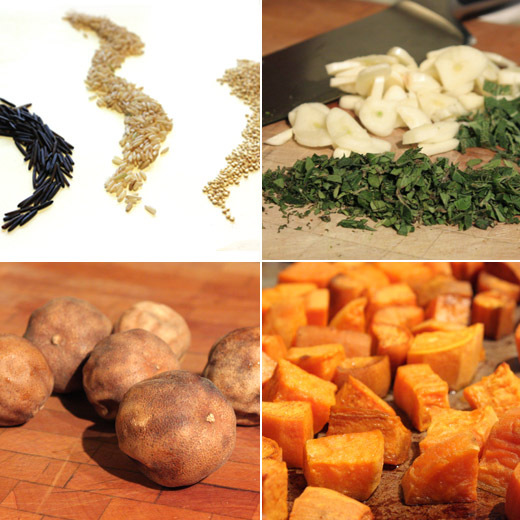 You can check on what Cheryl has cooked lately on her food blog as well. Last spring and also last December, Cheryl was an artist in residence at the Yaddo artists' colony, where she was working on her memoir. That memoir, A Tiger in the Kitchen , will be released tomorrow February 8, and it tells the story of how she discovered her Singaporean family by learning to cook with them. I knew I'd hear some good recommendations when I asked Cheryl, what are you reading? I'm in love with this book -- it's a wonderful narrative about a little town in Brittany, France, where the famous Belon oysters are cultivated. You learn about the people, the stories, the history of these oysters -- I adore travel narratives that share the tales behind what's on your plate. Clark won the 1964 National Book Award for this work -- a great achievement for a food narrative. Trillin is one of my absolute favorite writers -- so insightful, so funny, always spot on. I'm enjoying reading about his eating journey in America and Europe with his wife, Alice, by his side. I always come away from reading his pieces and books -- Travels With Alice is another favorite -- feeling like I've been there, sitting at that table elbow to elbow right next to them. The best travel writing does that for you. Ken Wells is one of the most engaging writers I know and his appetite for life really comes across in this book -- it's a hugely entertaining account of his journey across America, following the Mississippi River from Minnesota to Louisiana, talking to beer makers, drinkers and experts. (While drinking some beer, of course.) I'm not a huge beer drinker but I'm enjoying learning about beer culture and lore in the U.S. -- and I now want to see the World's Largest Six-Pack in Lacrosse, Wisconsin! This is just an enchanting book about a detective who enters the dreams of a murdered man in order to solve a crime. The writing is lovely and filled with charming little details -- I was hooked from the moment I saw the word "umbrellist" used to describe the protagonist on the first page. I recently met Jedediah Berry at Yaddo, an artists' colony in upstate New York, where we were both working on our books. He's an unusual, fascinating guy, which made me really want to read his book -- which, just like Jed, is turning out to be a real treat so far. Having just celebrated Chinese new year, I have Asian cookies and sweets on my mind. It's always around this time of year that I pull out Pichet Ong's The Sweet Spot and leaf through it, looking for treats to make to celebrate the lunar new year. It's hands down the best book on Asian desserts out there -- there are some recipes for traditional favorites of mine (mango sticky rice, fried bananas) as well as modern desserts he's created. I love that he uses ingredients like Horlicks (the British malted milk drink) and kumquats that you don't often see in American desserts. My favorite recipe in there, though, is his lemongrass frozen yogurt recipe -- it's incredibly easy and makes for a refreshing end to any meal. My guests always love it when I pull that out of the freezer for dessert. Thank you for participating, Cheryl. Check back to see who answers the question next time and what other books are recommended.